Tag line: "Punishment comes one way or another"
Between the two of them, Jeff Bridges and Matt Damon have garnered 9 Academy Award nominations (six for Bridges, including a win as Best Actor for 2010’s Crazy Heart, and 3 for Damon, though his only Oscar victory was for co-writing the screenplay for 1997’s Good Will Hunting). Yet as good as they both are in the Coen Brothers’ 2010 remake of True Grit, the film’s best performance is delivered by a teenage girl making her big-screen debut. The father of 14-year-old Mattie Ross (Hailee Steinfeld) has been killed by a man in his employ named Tom Chaney (Josh Brolin), who has thus far successfully avoided capture. In the hope of bringing him to justice, Mattie enlists the help of Rooster Cogburn (Bridges), a hard-drinking U.S. Marshal who shoots first and asks questions later. Along with Texas Ranger LeBouef (Damon), who informs them that Chaney is also wanted in Waco for the murder of a U.S. Senator, Mattie and Cogburn head deep into Choctaw Indian territory, where it’s believed the fugitive has teamed up with notorious outlaw Ned Pepper (Barry Pepper). Will Rooster Cogburn get his man, or will Tom Chaney once again slip away, perhaps never to be seen again? In the original 1969 version of True Grit, John Wayne played the ornery Rooster Cogburn, a role that landed him his one and only Academy Award for Best Actor. But with all due respect to the Duke, Bridges takes things a step further in his portrayal, adding dimensions and layers to the character that the ’69 film never bothered exploring. The first time we meet Rooster, he’s testifying in court, telling of how he was forced to shoot two men in self-defense (a story the defense attorney picks apart during cross-examination). At times, Rooster is downright cold-blooded; while questioning a dying man (Domhnall Gleeson), Rooster promises to give the poor guy a proper burial in exchange for information. Later on, when they’re preparing to leave the area, Mattie reminds Rooster of this promise, to which he replies that the ground is too hard, adding that if the man truly wanted to be buried, he wouldn’t have gotten himself killed in the winter. Yet despite his rough edges, we admire Cogburn’s tenacity, and are convinced he’s the right man for the job. Matt Damon is also strong as the boastful Texas Ranger LeBouef, who, while obviously more intelligent than Rooster Cogburn, isn’t quite as good a lawman (at one point, he allows himself to be surrounded by Pepper and his men, forcing a reluctant Cogburn to come to his rescue). Most impressive of all, though, is young Hailee Steinfeld, who delivers a performance for the ages as Mattie Ross, a no-nonsense youngster who speaks her mind and never backs down; early on, she barters with Col. Stonehill (Dakin Matthews), a businessman from whom her father purchased several ponies just before his death. Due to her age and the fact that she’s a girl, Col. Stonehill doesn’t take Mattie seriously at first, offering her $100 as reparation for the horse Tom Chaney stole (which belonged to her late father). His carefree attitude soon gives way to genuine concern, however, when Mattie instead demands $325 for the horse as well as the ponies, which are no longer needed. When Mattie threatens to contact her family’s lawyer to resolve the issue, Col. Stonehill acquiesces, paying the full $325 and looking as if he’d just gone 10 rounds with the Heavyweight Champion of the World. With a confidence that actresses twice her age rarely display, Steinfeld steals every scene, and is, at all times, the film’s most fascinating character. Along with its excellent performances, True Grit is a beautifully shot motion picture, with cinematographer Roger Deakins capturing images that are among the finest of his career (one sequence in particular, where Rooster and Mattie meet up with a traveling doctor in the middle of the woods, a gentle snow falling all around them as they talk, will take your breath away). 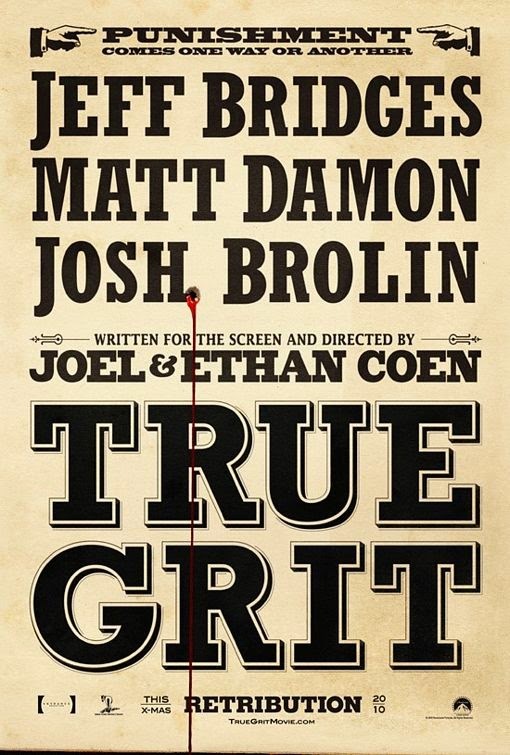 It’s been years since I’ve seen the original True Grit, but I do remember it being a very good movie. With their 2010 update, the Coen Brothers have taken what was a “very good movie” and transformed it into a masterpiece.